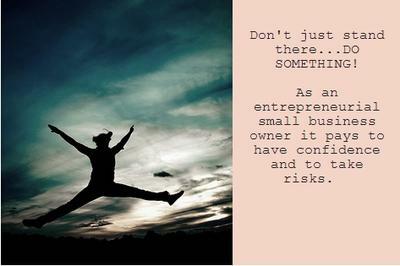 As an entrepreneurial small business owner it pays to have confidence and to take risks. Don't just stand there...DO SOMETHING! Confidence and Business Knowledge, Don't Leave Home Without It! I am the owner of my own marketing/PR consulting company and I have been in business for over five years. I worked in corporate companies for many years as an employee and in my tenure I found that the reason I was successful within the companies I worked for, was because I always operated as if I were an entrepreneur. The main constraint in my happiness within those companies was that I was bond by corporate company politics. These politics prevented me from truly executing a project the way I wanted. While going out on my own was a scary thought I knew if I wanted to truly do things with no boundaries and fully utilize my creativity I had to go on my own. I believe one of the most important traits of an entrepreneur is to always have confidence. Without it, you will not survive or you may not make that initial step. When I first began operating my own company, I always thought about how to save dollars, so I was constantly trying to wear different hats. I did my own taxes, I built my own website, I solicited my own clients, I did all of the marketing. This was a good and bad. While it was great that I knew how to do all of these things, there was no way for me to do all of it well. As An Entrepreneurial Small Business Owner, I Think It Is Crucial To Understand What Are The Required Expenses Needed To Run A Business. You should delegate work out where necessary, so you can concentrate on what you do best. Another key thing I learned is that you can't be scared to make a mistake. I was presented with a project to do PR for a high profile music award show. There was less than 4 weeks before the actual show date. My staff was concerned that there was not enough time and my company would look like failures in the industry if this is not pulled off correctly. I quickly stopped their negative thinking and stated "What if we do a good job and pull this off?" Knowing that we did not have a lot of time, I put together a plan and gave my client a list of things we could do and the risks for starting the PR plan late. They agreed to the plan and understood the risks. My Decision Paid Off Handsomely! We were able to successfully execute a good PR project. It was not perfect, but we learned a lot in this process, things we may not ever have learned if we did not accept the offer. Now we have a niche service to execute rush PR plans. The Key Lesson; DO SOMETHING.